It’s been a while since I have made anything in my kitchen. This is primarily due to the fact that my oven was not working for a while. In celebration of it’s resuscitation, I decided to make a big, hearty meal for me and the boyfriend. Asparagus was alarmingly cheap at this week’s Farmer’s Market and I got some high-quality black mission figs (dried) as well as a Meyer lemon, shallots, and fresh chives and fresh rosemary. Picked up some free-range, sprout fed chicken breasts on the way home, and sorted the rest out with what was already in the pantry. 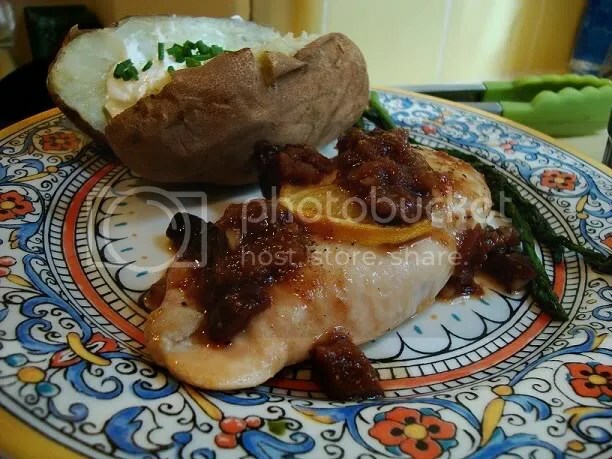 The Result: Baked lemon and rosemary chicken breasts with a home-made fig compote alongside grilled asparagus and a traditional baked potato. The chicken was incredibly simple (as most chicken dishes should be). I halved two split breasts (yielding four pieces) and seasoned with salt and pepper. After lightly greasing a small baking dish, I placed four thinly sliced lemon pieces on the bottom of the dish and picked off a few sprigs of rosemary and pressed them hard onto the bottom of each breast. I placed the chicken directly over each lemon piece and sprinkled more rosemary on top. I then placed 4 additional lemon slices over the tops of the chicken and put two tablespoons of chicken broth into the dish to help retain moisture. 40 minutes into a 375 degree oven. Using dried fruit has so many advantages. One of the advantages is being able to reconstitute them in a matter of minutes; giving you a plump and juicy fig. To do this is simple. In a small bowl or mug, place a handful (I used 10) of dried Black Mission Figs in hot water. Cover the bowl and let them steep in the water for at least 10-15 minutes. When you are ready to use them, just drain the water out– some people like to keep some of it aside just in case extra moisture is needed. I wasn’t in the mood to run to the store for some balsamic vinegar, so I made do with what I had in my pantry. For the compote, I pretty much eyeballed everything. While some people are particular about the proportions used in a recipe, I believe in intuitive cooking– fig compote/sauce? Add things slowly until it is to your liking. For the compote, I coarsely chopped up my figs along with just a little bit of shallot and two garlic cloves. I tossed them in a little bit of olive oil over a medium heat until the juices and fruit began to give and break down. Once the garlic started to brown a little, I added a few splashes of chicken broth, a splash of red Marsala cooking wine, and a tablespoon or two of white distilled vinegar. Salt and pepper to taste and half a pinch of red chili flake, and you’re on your way. For a richer thickness and for more liquid, I gradually added more broth and a little of the fig water and two tablespoons of unsalted butter, then brought the heat back up for a nice reduction. I finished it off with just a tiny pinch of white sugar. Vegetarian? I haven’t tried this yet, but this compote (swapping out animal products with veggie broth and olive oil instead of butter) would probably go nicely over some baked or fried tofu…I could even see it pairing well with some really dense tempeh. If anyone ends up trying this, let me know!